Product prices and availability are accurate as of 2019-03-10 22:36:23 UTC and are subject to change. Any price and availability information displayed on http://www.amazon.com/ at the time of purchase will apply to the purchase of this product. In the not too distant future, an older Bruce Wayne trains high school student Terry McGinnis to become the brand-new Batman, guaranteeing the defense of Gotham City for several years to come. 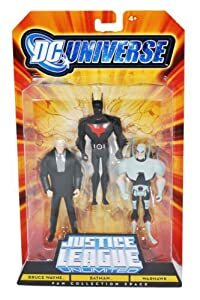 This brand-new Batman ultimately signs up with the future JLU, coordinating with heroes such as Warhawk, the tough-as-nail kid of John Stewart and Shayera Hol.